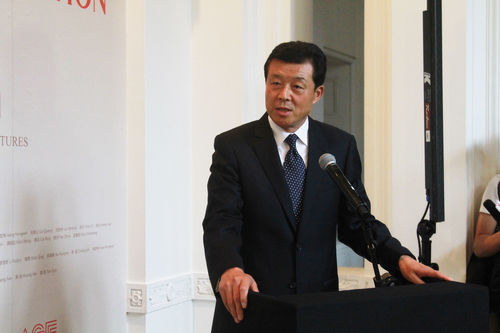 I warmly congratulate this opening of the China Art Exhibition London 2012 in the Royal Academy of Arts. Some of you may recall an event here six years ago. This was a high profile exhibition called China: the Three Emperors, 1662-1795. That exhibition was held here in this outstanding building that is justly celebrated for its fine tastes and high standard in the arts. Chinese President Hu Jintao and Her Majesty the Queen jointly attended the opening ceremony. That exhibition went on for 5 months and was immensely popular. That exhibition was a successful display of ancient Chinese arts. 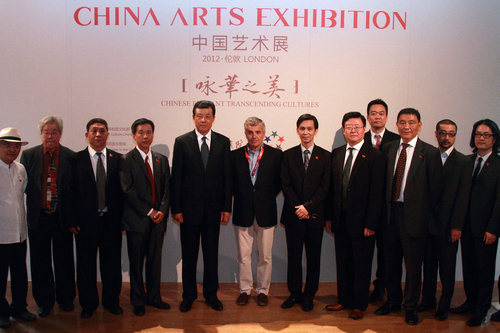 Today the China Art Exhibition London 2012 is a showcase of contemporary Chinese arts. This exhibition is special for the following reasons. First, the selection of artists. Among the 160 exhibits, 35 are works of modern Chinese artists. They may belong to different age groups, but they are all highly accomplished in their fields. These fields range from traditional Chinese styles to oil painting and sculpture. Second, it is special for the distinctive features of the works. Most of the works before you are about people and events in contemporary China. They tell stories about what Chinese people are thinking about. They bring visitors close to what is happening in China. Third, it is special for the techniques and skills employed in artistic expression. These works reflect deep training in traditional Chinese arts. However what you see also demonstrates exciting and imaginative accomplishments in applying new concepts, new techniques and new materials. When you have had time to absorb all these works I am sure you will conclude this is a superb exhibition that has built upon tradition and integrated East with West. 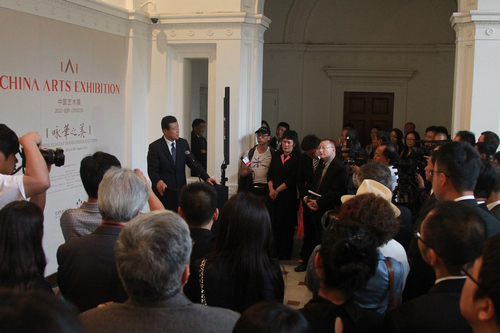 The exhibition creates one more highlight as we mark forty years of full China-UK diplomatic relations. This exhibition also provides another wonderful contribution to the cultural celebrations of the London Olympic Games. This rich display of contemporary Chinese art is like no other. It offers visitors from Britain and around the world an exceptional insight into contemporary China and modern Chinese arts. I have no doubt this exhibition will be a stunning success!